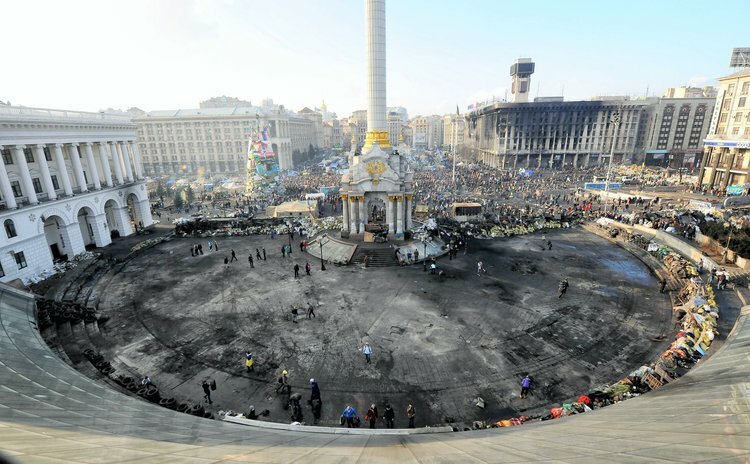 KIEV, Feb. 21, 2014 (Xinhua) -- Photo taken on Feb. 21, 2014 shows a view of the Independence Square in Kiev, Ukraine. KIEV, Feb. 22 (Xinhua/Sun) -- A tense calm prevailed in the Ukrainian capital after President Viktor Yanukovych and opposition leaders signed a deal on Friday to end the country's violent crisis which had left deaths and injuries. The peace agreement envisaged constitutional changes, an early presidential election this year and the formation of a national unity government within 10 days. However, things in the Independence Square, the main site of anti-government rallies since November, did not seem to be going as many expected. Thick and choking smoke, blackened walls, guarded exits of encampment, scattered household supplies, and protesters chanting slogans under the podium of speakers -- all of these were reminders of intense clashes and bloodshed that had torn up the former Soviet republic in the last three months. With the tense calm shrouding the square, some predicted the demonstrations there might not be over despite the peace accord, believing the opposition would not quit such an arena. Instead of dismantling the camps and leaving the square after the deal was struck, demonstrators pitched new tents to replace those burnt down in clashes with the police. Outside the square, Ukrainians were apparently divided on the internationally mediated agreement. Alexander Usyk, a student of Kyiv National University of Construction and Architechture, told Xinhua that the accord was a right move for all parties. "Now that the economy is gloomy, clashes cannot drag on forever. Getting out of the crisis is in line with Ukrainians' aspiration for peaceful life," he said. However, the accord was unsatisfactory for businesswoman Oksana Lytvyn. She believed the presidential election should be held immediately and those responsible for violent clashes and casualties should be punished. People were seen walking and children playing along the Dnieper River in Kiev. A taxi driver said life in most parts of the city had returned to normal, except the Independence Square and surrounding areas.